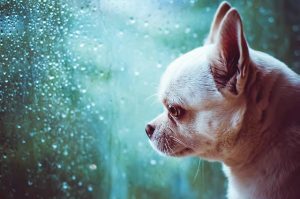 Q: How can I help my dog handle the loss of someone special? More broadly, how can we help our pets with loss and grief? All of a sudden, someone they love might disappear. This could be the loss of a human family member, pet sibling, close friend or therapy dog’s patient. A: Carrie Iverson of Paws Abilities Dog Training shares that, much like humans, “dogs have a grieving process.” The emotions that your dog is feeling are very intense and real. In fact, the emotional centers of the brain are virtually identical in dogs and people, even if the cognitive thought centers are quite different. There are many stages of grief, and Iverson shares that there are just as many tools that can help your dog through this difficult time. Your dog may be interested in investigating the corpse of their loved one, or they may not seem to know that they have passed on. Some dogs will try to play with their friend. Some dogs will even pretend not to notice the body—a stress-alleviating behavior that is similar to an uncomfortable dog turning away from whatever upsets them. There is no “right answer” to grief for dogs, just as there is not one for people. Each individual will cope differently, and that’s okay. After the death of a loved one, Iverson recommends that you “stick to a normal routine” and keep your dog engaged through training classes, playdates, field trips, or extra snuggle time. A K9 Nose Work or fun tricks class may be just what your dog needs to regain interest in life if he or she seems depressed. Because everyone grieves differently, give your dog some time to return to normal. However, if he or she is not recovering or seems so depressed that you are concerned about their quality of life, don’t hesitate to seek additional help. Your veterinarian can perform a thorough physical exam to make sure that there is nothing else going on, and may also prescribe a brief course of anti-depressant medication to help your dog with their big emotions.